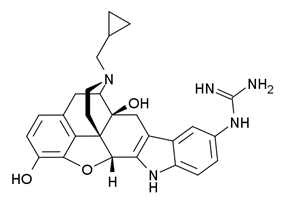 5'-Guanidinonaltrindole (5'-GNTI) is an opioid antagonist used in scientific research which is highly selective for the κ opioid receptor. It is 5x more potent and 500 times more selective than the commonly used κ-opioid antagonist norbinaltorphimine. It has a slow onset and long duration of action, and produces antidepressant effects in animal studies. It also increases allodynia by interfering with the action of the κ-opioid peptide dynorphin.